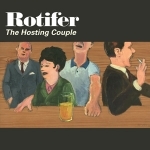 Rotifer's single of Edwyn Collins & James Endeacott's AED Records. Shot in and around Canvey Island. This was Robert's first visit back since he was 12 years old.